Netti Grandis positioning leg supports for complex individual configurations. Reduces pressure and shear forces. For users with e.g. contractions, leg asymmetry, elephantiasis. The foot support is characterized by unique ergonomics and user-friendliness due to lifting handles, scale displays and conical extension pieces. Angle adjustable incl. angle limiter and adjustable calf- and foot supports. The Savant head support is a unique support for the head. It is cool, light-weight and can easily be shaped by hand. The gel pads give soft, customized head support. A perfect fit! 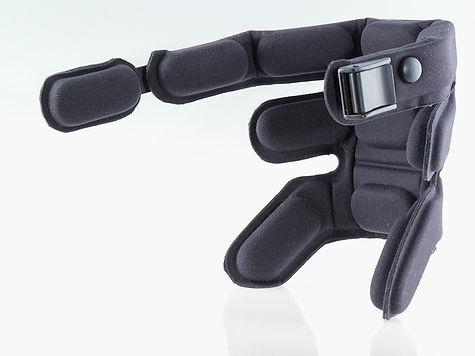 It provides head support at three levels on the head to control lateral flexion and rotation. A headband can be used for anterior head support. KNOW WHICH ARTICLE NUMBER TO ORDER? A Unique Device that Permits Wheelchair Headrests to Rotate 30° to each side. DO YOU NEED SPARE PARTS FOR A WHEELCHAIR? We offer a complete range of spare parts for all present wheelchair models - no matter how old the wheelchair is. You can find a complete overview of the spare parts in our spare part catalogues. Do you have a wheelchair that is no longer in our product range, we offer a spare part supply guaranty of 5 years, e.i. we supply spare parts 5 years after we have terminated the sales of the wheelchair model. Change the back rest height from 50 cm to 60 cm? Mount the side support Correction? You can find the answer to these question - and many more at My Netti TV, where we with short videos show how to do it.